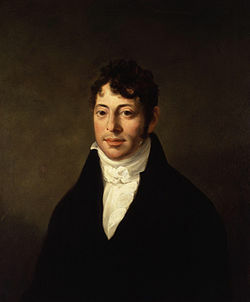 As we stock up, we might send silly birthday greetings to Joseph Grimaldi; he was born on this date in 1778. The most popular English entertainer of his day, Grimaldi was an actor, comedian and dancer who effectively invented the character of The Clown as today we know it. 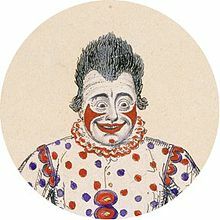 He became so dominant on the London comic stage that harlequinade Clowns became known as “Joey”; both that nickname and the trademark whiteface make-up that Grimaldi created were, and still are, used widely by all types of clowns. His catchphrases “Shall I?” and “Here we are again!” still get laughs in pantomimes. Grimaldi’s memoir, edited by his fan Charles Dickens (who had, as a child, seen Grimaldi perform), was a best-seller. The annual memorial service held for him (in February at Holy Trinity Church in the London Borough of Hackney) is attended by hundreds of clown performers from all over the world– who attend in full make-up and costume.